Naomi Lea was born on August 23, 1931 in Crawford County, MO, the daughter of William and Minerva (Jones) Willhite. While growing up, Naomi and her family lived in the Cuba and Leasburg area. Naomi was united in marriage to Raymond Hamm on April 16, 1949, and they were blessed with two daughters, Gayle and Kay. Naomi was employed at Paramount Headwear for over 30 years, where she was a floor lady. She had a green thumb and enjoyed flower gardening. Naomi also crocheted, embroidered, and made many quilts for her children, grandchildren and great grandchildren, whom she adored. Naomi attended First Assembly of God for many years. 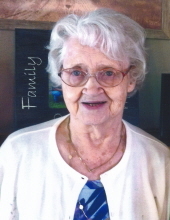 She will be lovingly remembered and missed by her family. Naomi is survived by her two daughters, Gayle Brewer and husband, James, of Sullivan, MO, and Kay Cuneio and husband, Larry, of Sullivan, MO; two grandchildren, Doug Cuneio and wife, Amy, of Grover, MO, and Dana Tutterrow and husband, Stacy, of Sullivan, MO; five great grandchildren, Ian, Sydney and Adam Tutterrow, Zoe and Mia Cuneio; two sisters, Delores Beckett of Cuba, MO, and Orpha Willhite of Cuba, MO; good friend, Mary Gerbler of Sullivan, MO; nieces & nephews, other relatives and many friends. She was preceded in death by her husband, Raymond Hamm; and her parents, William and Minerva (Jones) Willhite. Funeral services will be conducted 12:00 PM, Friday, March 29, 2019 at First Assembly of God in Sullivan, with Pastor Kyle Phillips officiating. Burial will follow in Meramec Hills Memorial Garden in Cuba, MO. Visitation will be held from 10:00 AM to 12:00 PM, Friday, March 29, 2019 at First Assembly of God in Sullivan. Friends may send online condolences to the family of Mrs. Hamm at www.eatonfuneralhome.com. To send flowers or a remembrance gift to the family of Naomi L. Hamm, please visit our Tribute Store. "Email Address" would like to share the life celebration of Naomi L. Hamm. Click on the "link" to go to share a favorite memory or leave a condolence message for the family.